Craig Thompson is what you could call a global citizen. He’s constantly on the move and his business card has mobile numbers for Hong Kong, UK, Netherlands, Brazil, Latvia and Canada and the USA. Recycling International meets up with Thompson in New Orleans at the E-Scrap 2018 conference. How would you describe the shift in the market? ‘There has to be a major change in the way recyclers and the industry handle e-scrap plastics. Over 25% of the items received by a recycler for processing will be plastic. For the European market, with kitchen appliances such as kettles, toasters, hand blenders and coffee machines, the percentage of the assembled product can be as high as 80%. What are the main factors challenging the industry? ‘The lack of processing capacity and this presumption of receiving an income for e-scrap plastics are some of the main challenges. 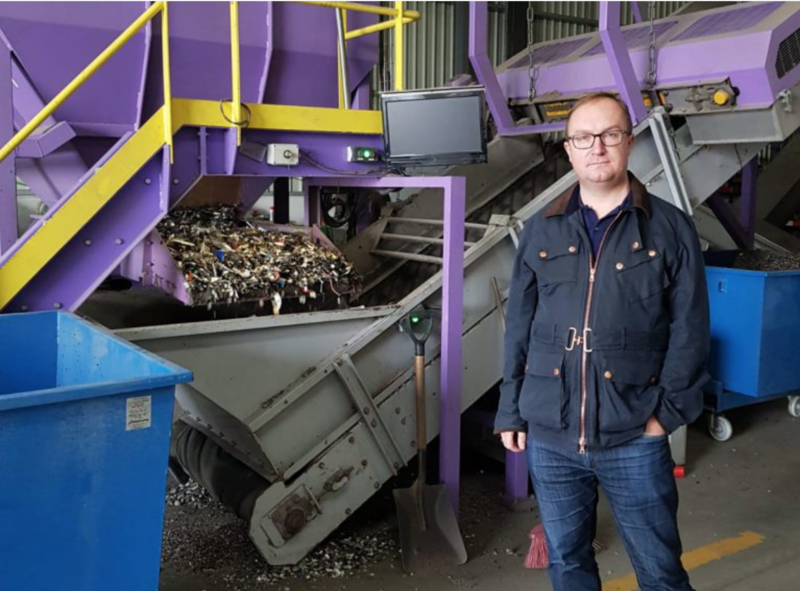 As for CRT TV monitor plastics: there are some established recyclers in the US and Canadian markets receiving, treating and processing these plastics but at a much reduced value to what recyclers received when exporting baled CRT plastics to Asia. China is being followed by others in the region in banning scrap imports. Based on your experience, what do you see? ‘It is not a sustainable or even ethical for western countries to send plastics in the volumes they generate to smaller countries who do not have the infrastructure or capability to cope. They can only just about handle their own plastic waste without adding huge volumes of PET bottles, HDPE (shampoo, detergent, household bottles), LDPE (agricultural films, food packaging) and e-scrap plastics. Vietnam and Thailand are already closed to e-scrap plastics. Some may still take clean washed regrind but not baled or shredded materials. What is the impact of import bans on e-scrap trading businesses? ‘Traders have either left the market or will do so shortly. Shipping lines are requesting large deposits on containers before loading them to ensure the container will be unloaded at the destination point and return empty. With Asian export markets closing, and reduced margins and policy changes in those countries receiving the plastics, it is just too risky for most traders. What proportion of companies has changed their business because of import restrictions in Asia? ‘If they have not done so already, all such businesses will have to reshape. Regulations, legislation, permitting, health and safety regulations, product handling, tenders, certification and auditing – the list continues – are a large part of every recycler’s monthly routine and the paperwork burden will only increase. Those that have automated shredding and processing lines with investment in new processing equipment will gain market share, especially in the US and Canada. With new state legislation for recycling of e-scrap coming into force over the coming years, their volumes will increase. Which other changes in business models do you see? If you were asked to offer these businesses a survival kit, what would your top three tips be? ‘What do you see happening two years from now? And what of the longer term, let’s say in 2025? ‘Every country, irrespective of the waste stream it generates, should stop exporting and process more – if not all – at home. There has been a major lack of investment in domestic recycling because it has been too easy to load a container and export it to Asia. ‘Lets not end on doom and gloom. Recycling is the way forward, technology and solutions do exist to recycle plastics and other waste materials. I can give you a long list of European recyclers who go beyond shredding e-scrap and carry out further processing, producing high quality consistent plastic regrind from e-scrap as well as pelletising.